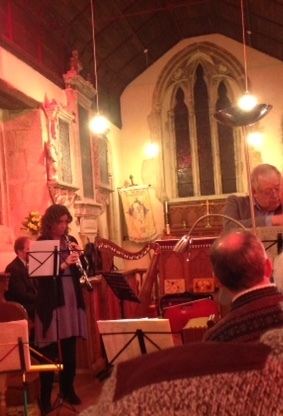 Many thanks to Sandy Mackenzie and her talented friends for putting on such a delightful concert on 21 February, all the proceeds of which will go to the church fabric fund. The pieces were well chosen and performed beautifully, and it was great to have each musician introduce us to their particular instrument - frequently with jokes. 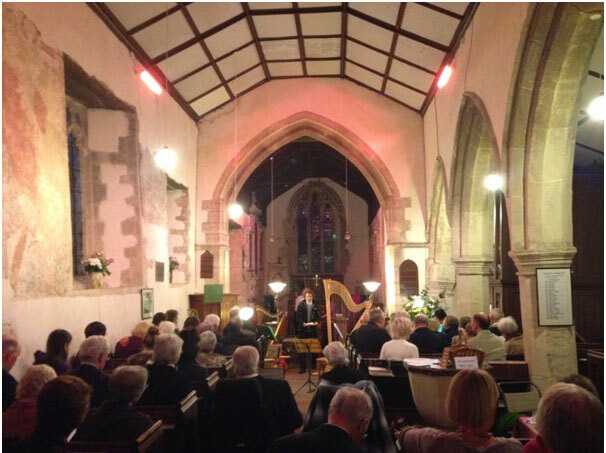 We won't soon forget the story of the exploding harp or the unexpected demonstration of the hosepipe/petrol funnel trumpet (don't try this at home!). 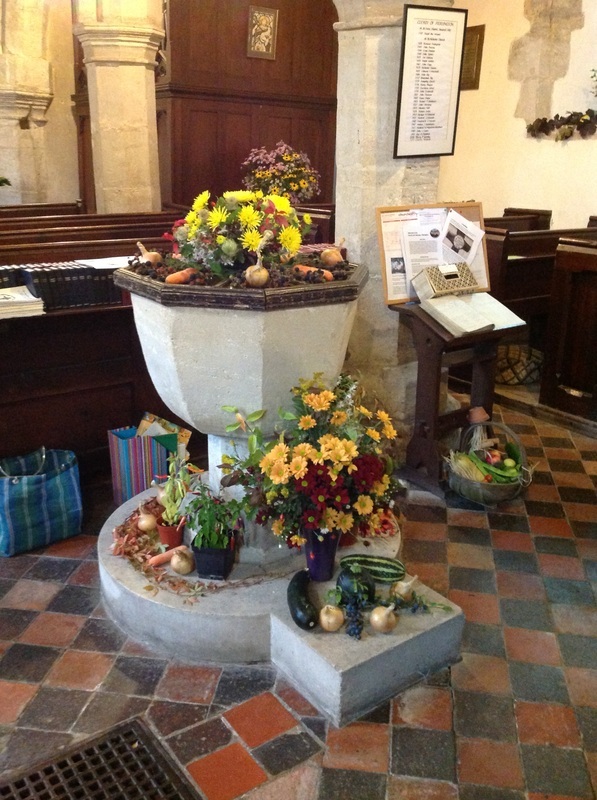 Here are a few pictures of the church decorated for Harvest Festival weekend on 4/5 October 2014. The homemade cakes went down well too! 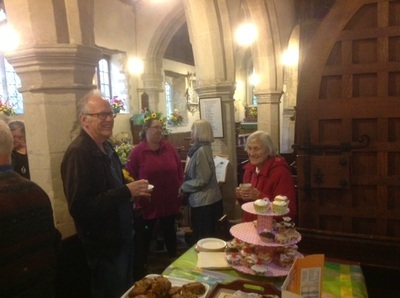 Many thanks to everyone who helped and who came and bought refreshments on Saturday. All proceeds are in aid of the church fabric fund. 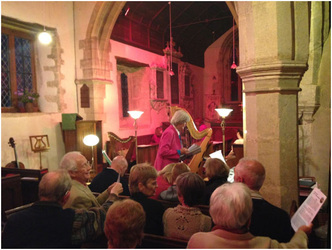 On Saturday 12 April 2014 at 7.30pm, a concert will be held in St Nicholas’ Church, Piddington, to raise funds for the ongoing work needed to maintain and repair the church fabric. 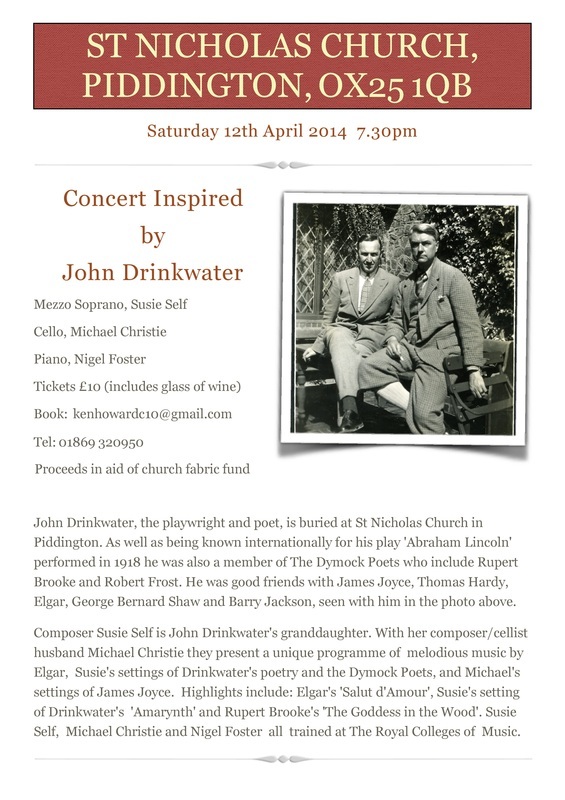 The concert is inspired by the poet and playwright John Drinkwater, who is buried in St Nicholas’ churchyard. 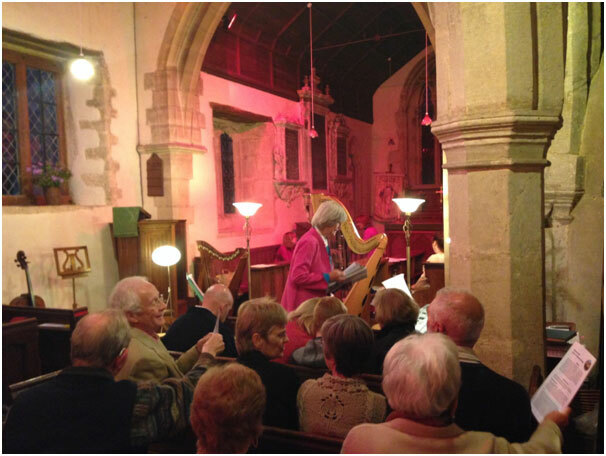 While seeking outside sources of funding, we were delighted to discover that John Drinkwater's granddaughter is the talented and dynamic composer, singer and conductor Susie Self. When Susie and her husband, the composer and cellist Michael Christie, heard of our need to fundraise to secure the future of this ancient church, they offered their services free of charge to help. Susie and Michael, accompanied by the pianist Nigel Foster, present a unique programme of melodious music including: Elgar's ‘Salut d'Amour’, Susie's setting of Drinkwater's ‘Amarynth’ and Rupert Brooke's ‘The Goddess in the Wood’. 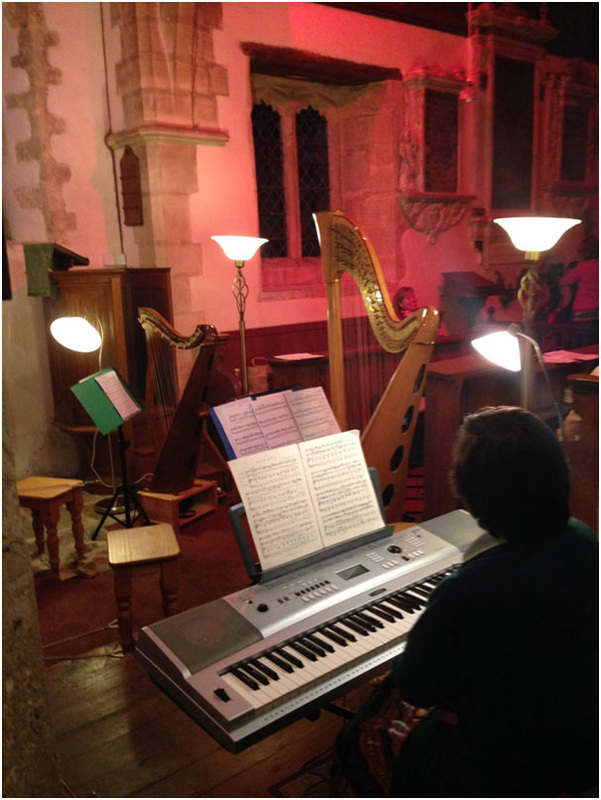 All three musicians trained at the Royal Colleges of Music and now create and perform music all over the world. Susie’s cousins are Nigel Kennedy and Will Self. 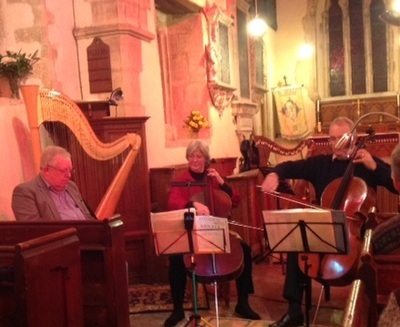 We are very privileged to have musicians of the calibre of Susie, Michael and Nigel performing in our church. There are profiles of Susie and Michael here, and of Nigel here. 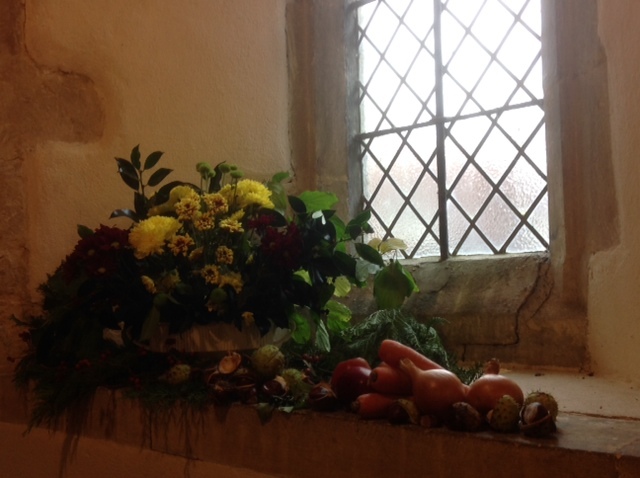 Even some Piddington residents may be unaware that under a tree in St Nicholas’ churchyard, opposite the church porch, is the grave of John Drinkwater (1882–1937), poet and playwright. Born in London, Drinkwater spent much of his younger life in Piddington, and some of his best work was inspired by Piddington and the surrounding countryside. Find more information, and hear John Drinkwater reading his poems, here. 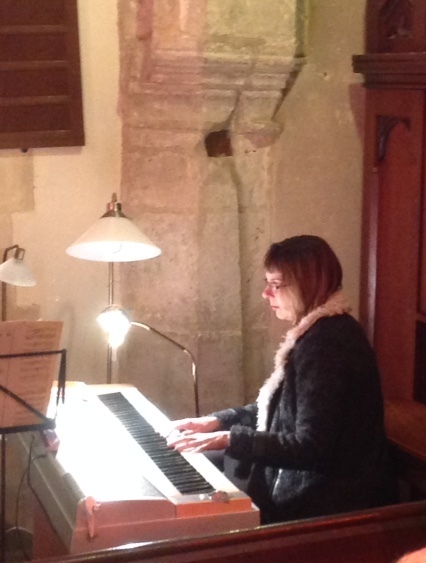 A huge thank you to the carol singers, who carolled their way around Piddington on 19th December. 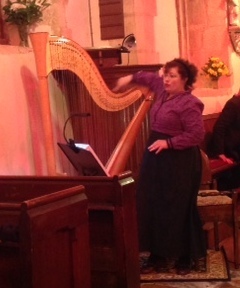 The singing was wonderful, and the accordion really made those carols swing! I do hope they all enjoyed some mince pies and a glass of something warming at the end. 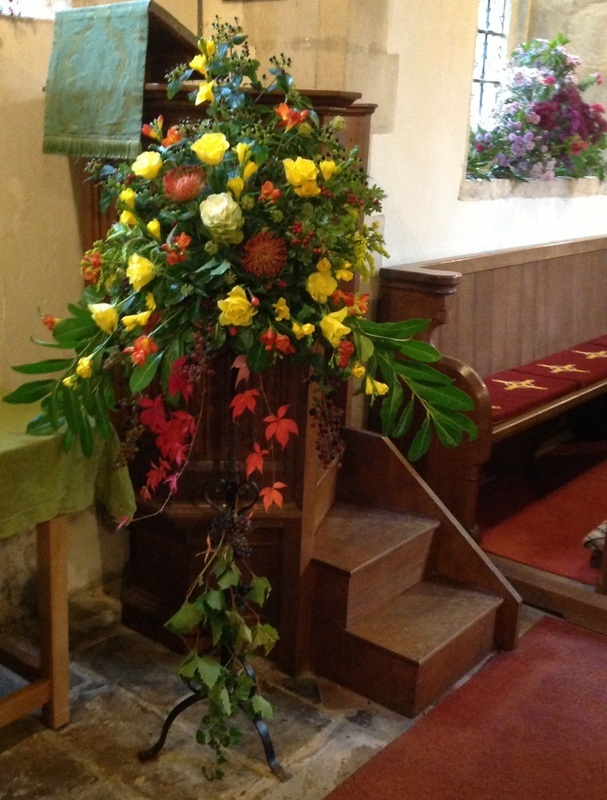 The church looked really lovely on the weekend of 6/7 October, decorated for Harvest Festival. 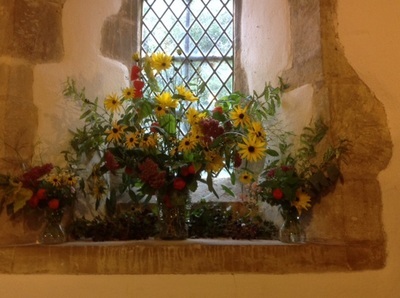 Many thanks to everyone who helped to make the church so welcoming to visitors on Saturday. If you weren't able to be there, here are a couple of photographs of the beautiful arrangements. There are some more in the Gallery (scroll down to ‘Events and activities’). 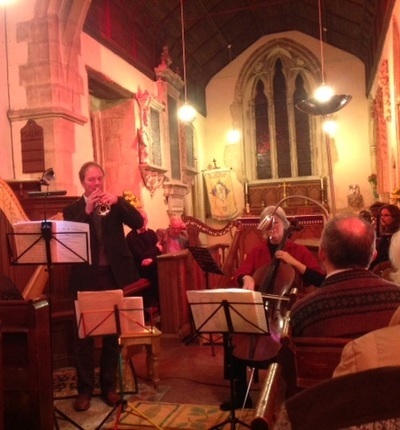 Grateful thanks go to Sandy Mackenzie and all the musicians who gave a wonderful concert at St. Nicholas' Church on 20th September. 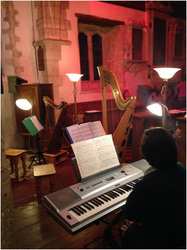 Proceeds will help towards the restoration of the church building. 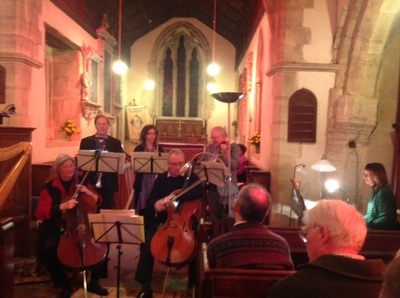 Many thanks to all those who supported such an enjoyable evening. 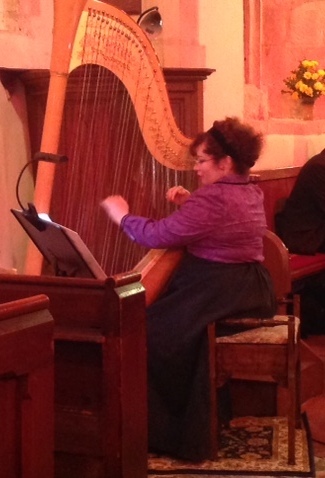 Below are a few photographs taken at the event. 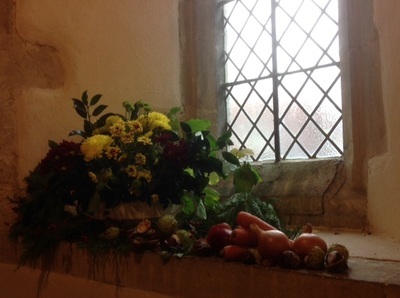 You will have noticed that, since the middle of November, work has been happening on St Nicholas' Church. The east window (the one that faces you when you walk into the churchyard) is almost completed and the renewed stone certainly assures us that all is now safe on that. 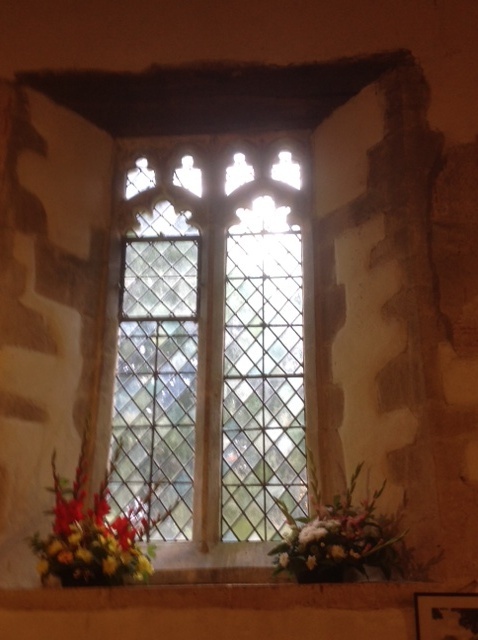 The window in the chancel (on the other side of the church) sees the loose stone cut away and the replacement stone ready for insertion. The rainwater goods are in the process of being repaired and repainted and, where necessary, being correctly realigned, so that they will work effectively. Some of these are really beautiful ... perhaps you have never noticed them? We are also looking at the cross above the east window. It needs to be removed, as it is in a unsafe state, but as yet we do not know whether we can replace it now or later. 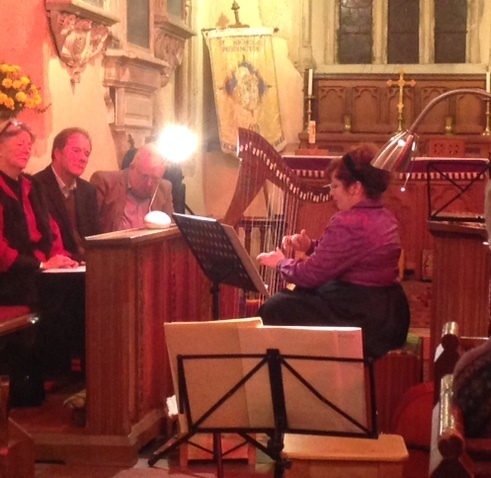 We remain very grateful to all those who have contributed in any way to the funding. During the early part of next year we hope to find out all that needs to be done in phase 2. 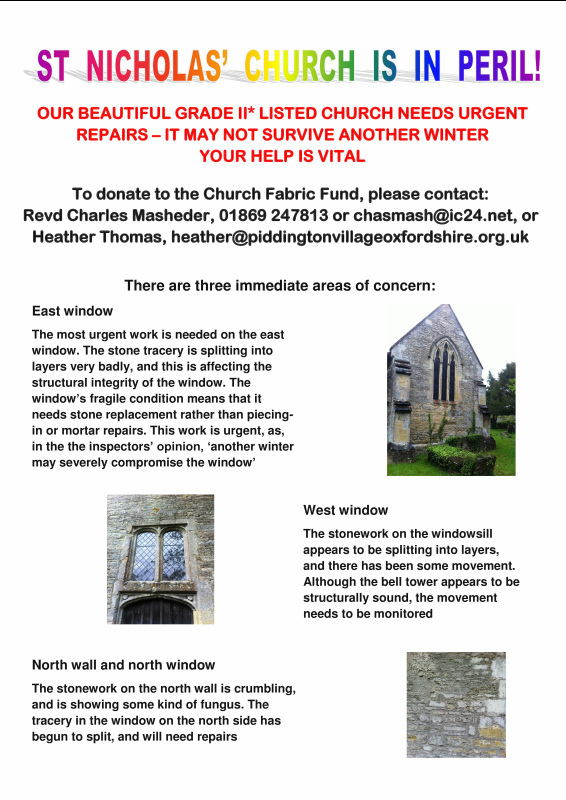 If you live in Piddington, you will have received a flyer outlining the reasons funds are needed for work on the fabric of St Nicholas' Church and asking if you can help in any way. You may have expertise in tracking down sources of funding and making the necessary applications, or simply some time on your hands to do the paperwork and admin needed. If you cannot yourself help, perhaps you know of someone else who may be willing to do so. 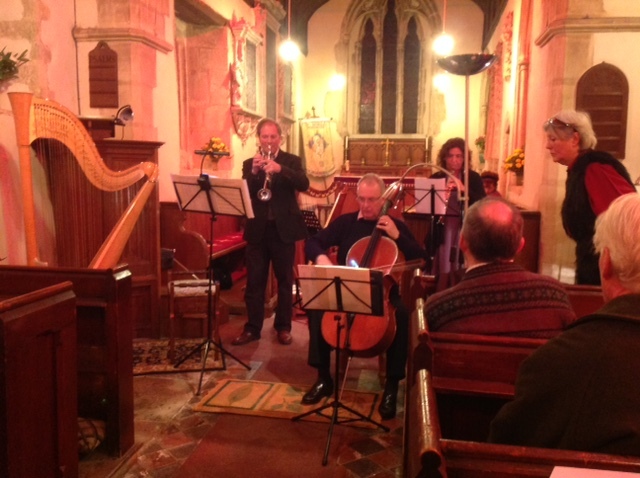 And, of course, any donations of cash - no matter how small - will be accepted most gratefully. The flyer is reproduced below. Please help if you can. St Nicholas' Church has been part of Piddington since the 13th century, but over the next few years many costly repairs will be needed. 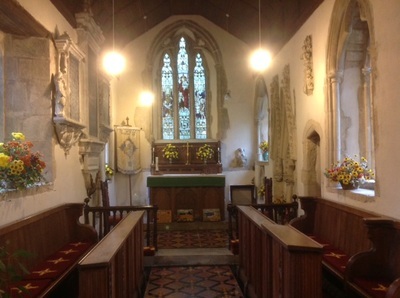 We are such a small village, it's hard to keep asking the same pool of people for funds for various causes, but I can't imagine many Piddington residents would be happy to see this beautiful little Grade II* listed historic building closed up and sold off to a private buyer, as is the fate of so many village churches. 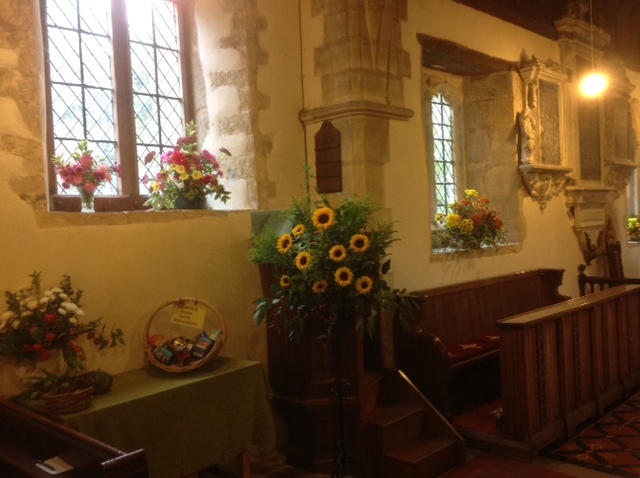 Keep an eye out for notices about events relating to St Nicholas' Church, and, if you are able to help with fundraising, please email Heather Thomas.